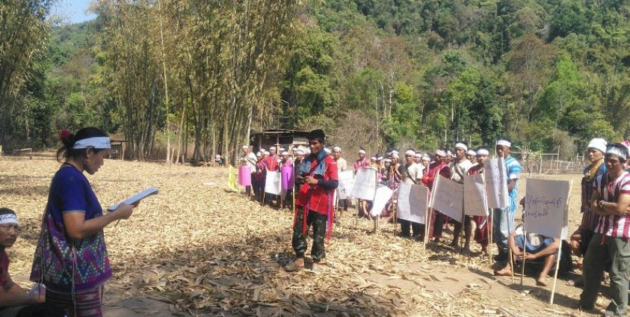 Local residents who have fled from the recent fighting in the Karen National Union’s Mu Traw [Hpapun] District held a prayer service for peace at Ler Kho Village of Ler Mu Plaw Village-tract in Lu Thaw Township on March 19 and called on the Tatmadaw to withdraw its troops. Around 1,000 residents from over 20 villages in Ler Mu Plaw, Khay Pu, and Yal Mu Plaw areas under Lu Thaw Township joined the prayer service. “We want to live in peace. We don’t like the Tatmadaw coming to build the road in our area. We, the villagers, have gathered to hold the prayer service because we don’t want a conflict,” said Saw Thio Muu, a resident of Ler Mu Plaw Village, who led the prayer service. The local residents prayed according to their faith and traditional customs and prayer sessions were held for respective religions. According to a statement released on March 19, the local residents demanded the Tatmadaw to withdraw its military outposts in their areas and called on the KNU leaders and the Tatmadaw to give priority to this issue. The local residents also demanded the Tatmadaw to stop building the road and urged the international community to provide aids to the displaced residents. “We don’t like the Tatmadaw’s activity in our area. We want them to withdraw. We are not happy because we, the villagers, have to flee due to the Tatmadaw’s activities. All of us have to flee,” said Saw Nyar Khee Thu from Ler Mu Plaw Village, who participated in the prayer service. The local residents, who rely on hillside farming, said they are unable to clear the lands as the clashes are breaking out nearly every night in their areas. Around 2,000 local residents have fled their homes due to the fighting between the troops under the KNU Brigade 5 and the Tatmadaw since March 4 after the Tatmadaw tried to resume the construction of Khay Pu-Ler Mu Plaw old road in Lu Thaw Township, which has been suspended since 2009.